Those who mourn are blessed: Reading scripture backwards. – Selah. Those who mourn are blessed: Reading scripture backwards. A few weeks ago our pastor taught on the Beatitudes, Matthew 5:3-12, and he highlighted something I hadn’t really considered: The verses from 3 to 12 are not simply separate sayings, like little nuggets of wisdom. Instead, they form a whole and each verse builds on the one before. They reveal a pattern for the life of a Christ-follower. The first thing that struck me was that these people were “blessed.” Blessed?! Blessed… Maybe they were blessed because each ‘bad thing’ was followed up by a comforting thing, like “Blessed are those who mourn, for they will be comforted,” but that’s a little morbid, isn’t? If we put up with mourning we’ll be blessed by being comforted? Joy… But I couldn’t get around the language, “Blessed are those who morn…” Blessed are those. You are, I am, blessed when I mourn. 1. consecrated; sacred; holy; sanctified: the Blessed Sacrament. 2. worthy of adoration, reverence, or worship: the Blessed Trinity. 3. divinely or supremely favored; fortunate: to be blessed with a strong, healthy body; blessed with an ability to find friends. 4. blissfully happy or contented. Read as a whole, I started to wonder, who lives all these things?, and of course whenever you ask something like that, especially about virtues, the answer is usually Jesus! So, I began to see the life of Christ in those words. Christ was poor in spirit, downtrodden, mispoken to, looked down upon. Christ mourned – for Lazarus, for Jerusalem, and certainly for the many he healed of sickness and sin, for his family because He knew where He was headed, for humanity as He hung on the cross because He knew who would ignore His Offer. Christ was meek – He didn’t respond in power when tempted by Satan in the wilderness. Christ hungered and thirsted for righteousness – He stayed behind at the temple as a child because ‘He had to be about His Father’s business.’ Christ was merciful – He had mercy on those he healed of sickness and sin. Christ was pure in heart – He lived a perfect life, to die a perfect sacrifice. Christ was a peacemaker – He didn’t incite violence from His followers, He went to the death peacefully. He was persecuted for righteousness’ sake – He went to the cross because He taught true righteousness. Christ is our example. He wasn’t teaching His followers something He wasn’t already going through. Blessed are those who mourn, for they are poor in spirit. It was true. Those who understand their true, sinful condition before a Holy, sinless God, recognize they are poor in spirit and they mourn because of it. Blessed are those who hunger and thirst after righteousness, for they are meek. The meek will admit they can’t do it on their own, they are not prideful, and they will search for what will cure them. Blessed are the merciful, for they hunger and thirst after righteousness. Those who find righteousness understand the mercy given to them in the sacrifice of Jesus Christ on the cross, for their sins – and they show mercy out of grateful hearts and true understanding of the gift they have received. Blessed are the pure in heart, for they are merciful. The Book of James says, “Mercy triumphs over judgment.” You will only find the pure in heart when you find the one who is also merciful for they have the Spirit of Christ living in them, Christ, the One who is Mercy. Blessed are the peacemakers, for they are pure in heart. Those who are pure in heart will also make peace with their neighbour because they are merciful, they know that strife would only harm their brother or sister. Blessed are those who are persecuted because of righteousness, for they are peacemakers. The peacemakers will be persecuted for their righteousness exactly because their persecutors are not peacemakers, because they are not pure in heart, because they are not merciful, because they are not hungry and thirsty for righteousness, because they are not meek, because they are not mourning, because they do not recognize their poverty of spirit. This is *jawdrop* and *mindblown* territory for me after actually parsing this scripture again and fleshing it out in writing. What we have here, in the Beatitudes, are the steps of living the life of a Christ-follower. Don’t know where to begin in your walk with Jesus? Start here. Start with mourning because you are truly poor in spirit, as are we all, and go from there, asking God and considering how to recognize each point and how to apply it in your daily life. 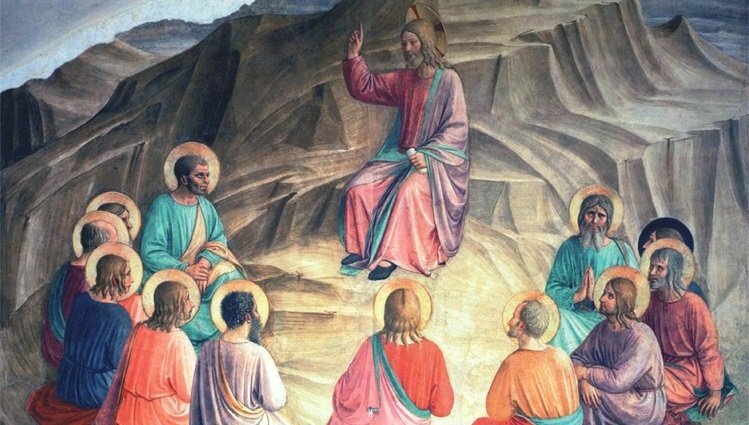 And what is our reward when we have ‘climbed’ this mountain of the Beatitudes and become ever so ‘holy’ and ‘saintly’? This, then, is where the text turns itself around and looks to your future because you have dealt with the past and present in the previous verses. Rejoice and be glad!, you who are persecuted for Christ’s sake, for great is your reward in heaven! Those who have come to the point of persecution via the narrow way, Christ’s way, rejoice and be glad! You share in Christ’s death, you will share in Christ’s everlasting life! Yes, this is as hard as understanding ‘blessed are those who mourn’. I don’t pretend to think that ending on an vacuous note of heart-pumping enthusiasm does justice to the actual day-in and -day-out life of a struggling Christ-follower. Christ is in you, Christian, your hope of glory! You can because He is able and He is with you. Next Next post: The End is Near: Seeing the Kingdom that is near, here, within, and coming.